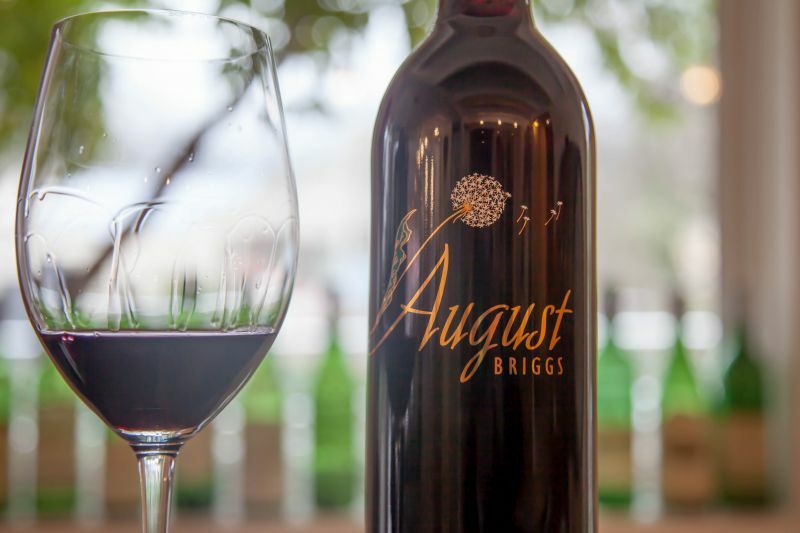 On a recent trip to the Northern end of Napa Valley, I dropped into August Briggs Tasting Room in downtown Calistoga. 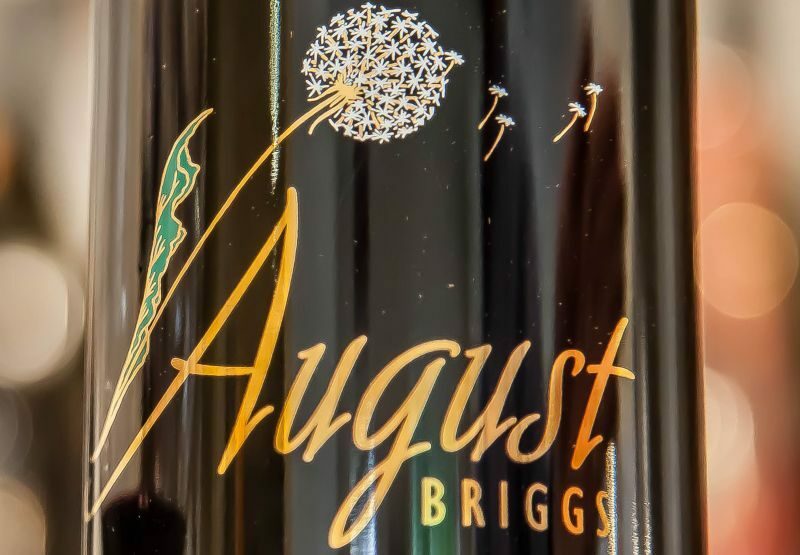 August Briggs offer their wines in a tasting room because they source grapes from several wineries across Napa and Sonoma and do not have their vineyard where visitors can go. They have been in this spot, on Lincoln Avenue, close to the Napa River, for seven years. California Girl comments: On this occasion, I was serving as the designated driver so I missed out on the tasting. However, having said that, The Brit came back to the car filled with enthusiasm and dragged me back to the tasting room to get a few photos. My host was Matthew Gocso, the vintner, and owner of August Briggs. The winery’s name is that of the founder. August’s nephew, Jesse is now the winemaker. The tasting started with a side by side pour of the 2015 Russian River Valley Pinot Blanc ($26) and the 2013 Carneros Chardonnay ($32). The former being 100% in stainless steel and the latter in 30% new oak. Matthew’s purpose in serving these together was to enable the customer to discover how they felt about the impact of oak on their wine. The Pinot Blanc provided a light nose of pears. Taking a sip offered a crisp acidity drink with a distinct finish of apples. With the acidity, this was a wine that needed food for it to be fully enjoyed. The Chardonnay had a punchier nose; with honey and vanilla at the fore. The flavour was more complex with pepper, pineapple, and a well-balanced oakiness. This was a smooth, drinkable example of oaked Chardonnay in which the wood had not been allowed to dominate. The third wine was the August Briggs 2013 Sonoma Coast Pinot Noir ($40). The potent nose provided a heady mix of cherry, toffee, and damp wood. The complexity of those odours was matched by a rich blend of coffee and raspberry flavours that led to a long finish with a pleasing fruity sweetness. This is an excellent example of a Pinot that can be enjoyed on its own or as an ideal complement for a juicy pork chop. Next up was the 2013 Old Vines Calistoga Zinfandel ($35). The wine is a blend of Zin from two vineyards: Canard and Luvisi. The root-stock at these vineyards dates from 1870’s, 1906, and 1920’s. The resulting wine is a showcase of Calistoga Zinfandel. Raspberry and cinnamon notes emerged from an intense nose. The flavour was more subtle that the nose suggested; the wine backing away from a stereotypical jammy mouth to offer a more nuanced blend of fruit. There was ripe, peppered plum that was sustained by well-integrated tannins into a long finish of lush fruit. In a tasting of well-constructed wines, this was my favourite and the one I purchased. In looking for a tasting room in Calistoga to try, it had been August Briggs’ inclusion of Charbono that had attracted me. This is an unusual grape and one that I have enjoyed in the past; both as a single varietal and in one of my favourite blends: Frog’s Leap Heritage. Matthew described it as a temperamental grape. There are just eighty-eight acres planted in the state. The 2013 Frediani Vineyard Carbon ($38) was an inky, dark purple in hue. The nose was of wet forest floor, baking spices, tobacco, and bereft of fruit. Taking a sip I was greeted by strong tannins that continued through the finish. Past those tannins, I tasted black cherry and cloves. This was challenging but impressive; as long as you enjoy intently dry red wine. The final wine was August Briggs’ 2012 North Coast Meritage; the only wine they offer that is not a single-varietal. Matthew explained that they had been offered Merlot from Spring Mountain and had decided to blend it with equal measures of Cabernet Sauvignon from Dry Creek Valley. The resulting wine provided an appealing nose of dark fruits, raspberry, and a backing of spice. The flavour was not as luscious as the nose, but was still excellent; with dark cherry and baking spices. This wine sells for $50. August Briggs offers three tasting options: the white and light red flight for $10, the bold red flight for $10, or all six wines for $15. The fee is waived with a wine purchase. California Girl comments: I will have to go next time and participate in the tasting. It sounds like I really missed out on some good wine. Bummer! 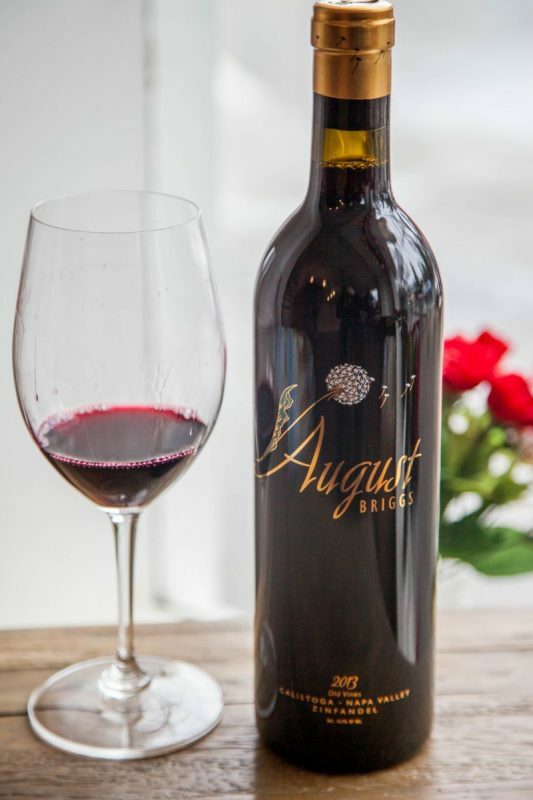 August Briggs offer two wine clubs; the sampler club and the big club. Both provide two shipments a year. The sampler is a commitment of eight bottles a year and the big club requires six to eight bottles in each shipment. The latter club allows you to swap out a bottle in each shipment. The Spring shipment consists of lighter wines and the fall release of bolder wines. Either club allows you to take a double allocation of one shipment and skip the other one. I was impressed with the service and the wine at August Briggs. The tasting fee is excellent value for Napa Valley and every wine was interesting, albeit with the Zinfandel as a stellar stand-out. 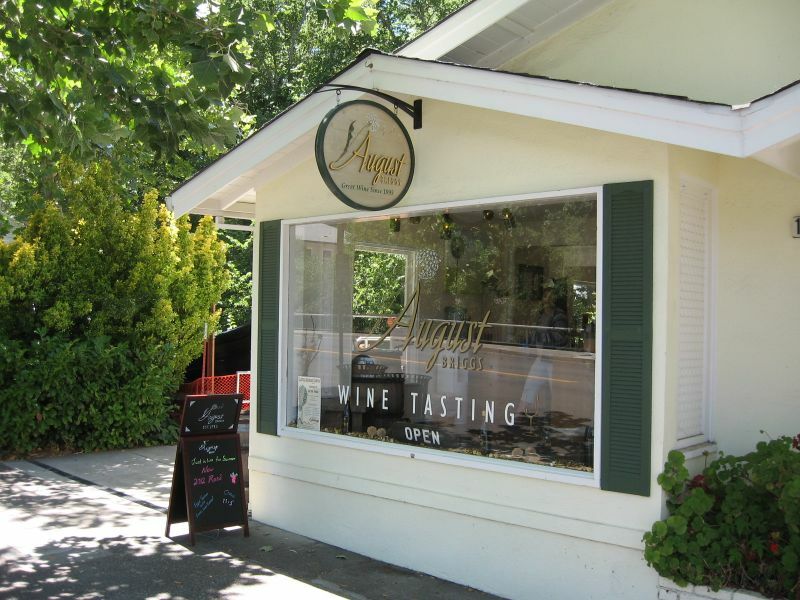 I would recommend this tasting room as a must visit if you are in Downtown Calistoga.